"The clean, simple lines make it seem effortless and that takes a lot of talent to achieve. This landscape architect has great confidence and knows exactly when to stop. The craftsmanship is amazingly crisp." PROJECT STATEMENT: Walden Studios, a working vineyard and mixed-use arts facility, is set in a broad valley in Northern California. The design is a powerful pairing of a straightforward concept and a restrained palette of materials that reflects the scale and quality of the larger agricultural landscape. 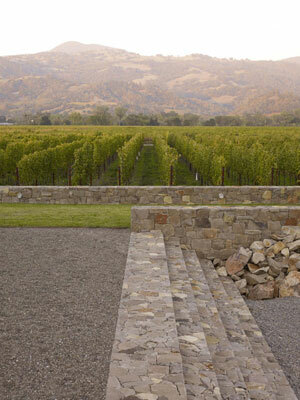 A requirement that the renovated building be raised for flood protection became the inspiration for the resulting design concept: a series of piers extending out into a sea of vineyards. PROJECT NARRATIVE: The project is sited in the flood plain of the Russian River, with deep, rich soil ideally suited for agriculture. 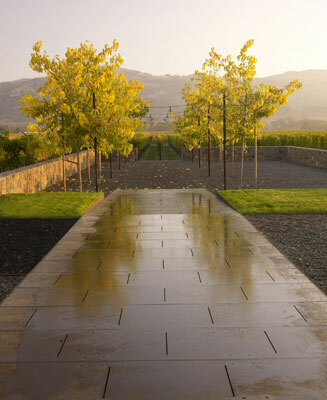 Although now a prime wine-growing region, historically the area was known for growing hops and prune plums, and this property originally served as a prune-packing plant. 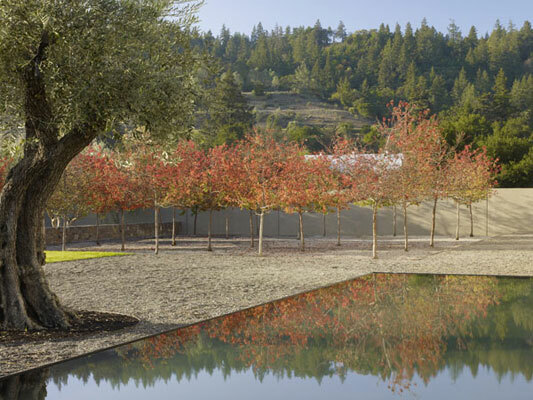 The design intention was to draw on the memory of the orchards that once filled the valley in order to create a palpable link with its agricultural past. 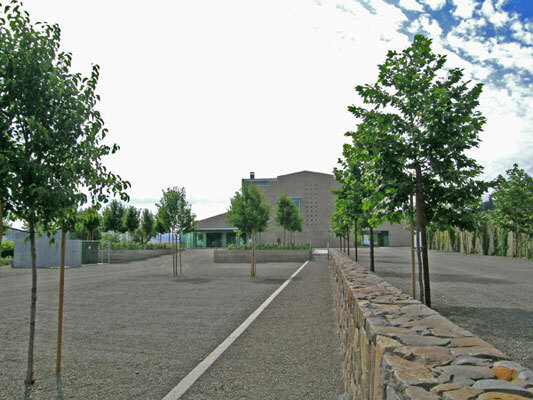 The owner, an avid patron of the arts, purchased the property with the intention of renovating the old warehouse into a support facility for his nearby ranch, which is home to a renowned collection of site-specific sculpture. As a result, Walden Studios is designed as a mixed-use facility with arts-related offices, artist studios and leased commercial space. 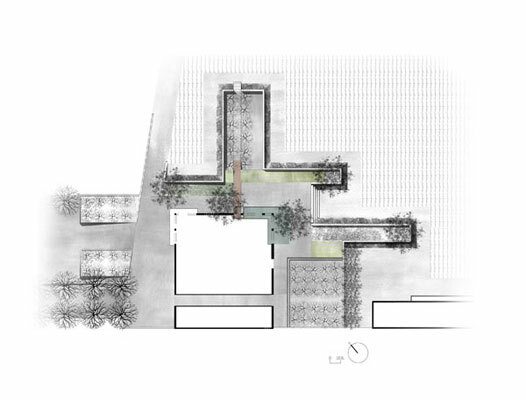 The site design integrates a working vineyard and its agricultural buildings with the arts facility. 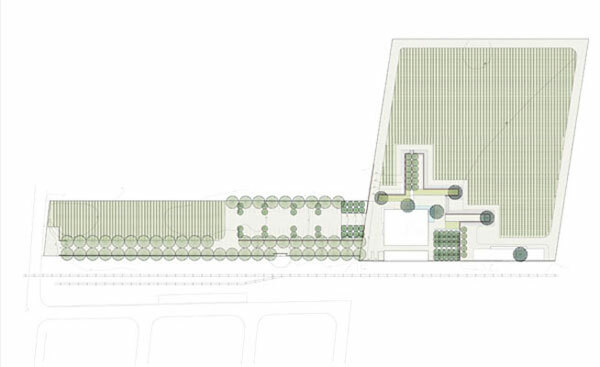 The site is approached along an axial entry drive lined with London plane trees. Parking for fifty cars is partially screened from the drive by a four-foot-tall, 260-foot-long freestanding stone wall. The vine-covered west wall divides the property from a rail line that originally served the warehouse. 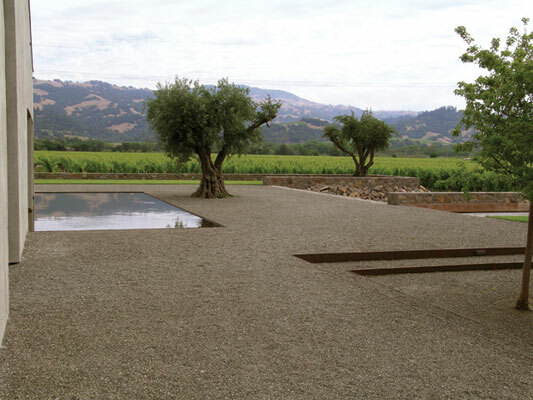 A carpet of crushed roofing gravel unifies the design, covering most of the ground plane except for the agricultural areas. The material is permeable and has a low albedo, reducing runoff and reflected heat. To comply with ADA requirements, the gravel is fitted with rings of Gravel Pave in the paths of travel to allow wheelchair access. A double allée of ‘Aristocrat’ pears planted in flanking terraces provides separation from the cars and effects the transition between the parking lot and the raised elevation of the building. The planning department required that the new floor elevation of the renovated warehouse be raised four feet above the existing valley floor as protection against periodic flooding. 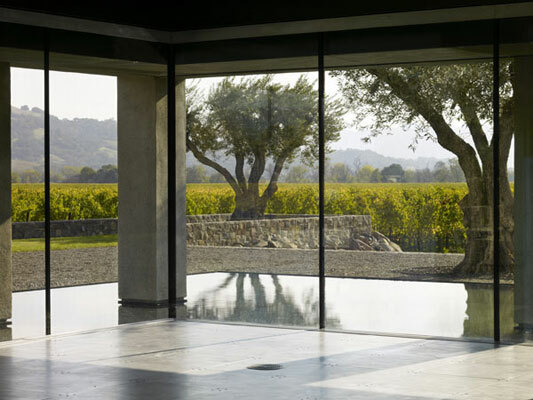 As a result, the landscape around this building was conceived as a series of “piers” or plinths elevated above the sea of vineyards, each one defining a courtyard with a unique character and function. 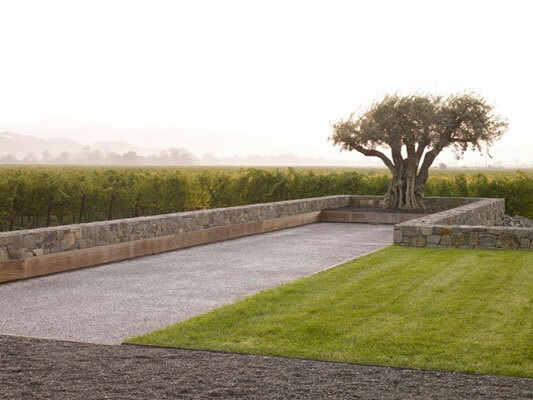 These terraces extend out into the vineyards, serving as outdoor rooms for receptions and openings. The subdued, economical design responds to this program. These plinths are defined by a seat wall of precisely fitted native stone that creates a datum around the project. 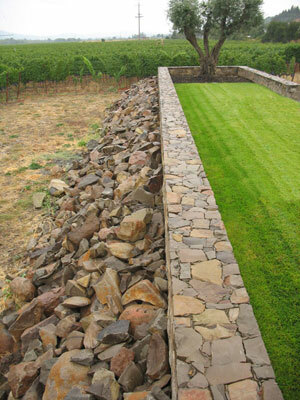 Large chunks of rough, indigenous rock are piled against the crisply defined wall to create a textural juxtaposition that highlights the interface between the outdoor event and recreational spaces and the vineyard below. The elevated piers are visually connected to the interior spaces and create links that reinforce the spectacular views over the valley. 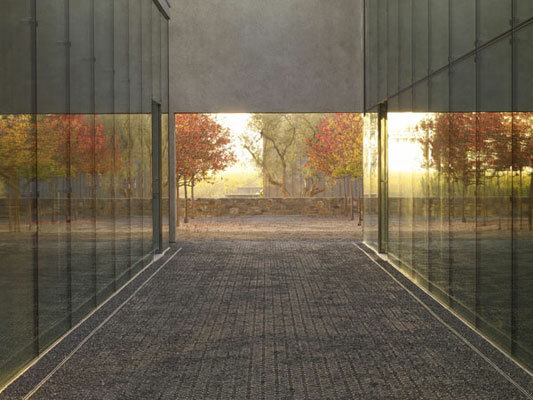 At the southeast corner of the building a nearly flush reflecting pool dissolves the border between indoors and outdoors, creating a feeling of a seamless plane connecting the interior aluminum flooring and the landscape beyond. The exterior spaces are designed to provide great flexibility of use, allowing multiple events to take place simultaneously without compromising the interconnectedness of the overall design. The main gathering areas are therefore defined by subtle grade changes that imply the edges of the outdoor rooms. 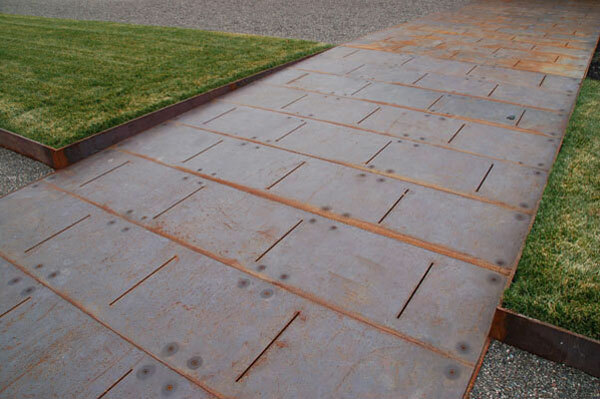 COR-TEN steel risers are used to define sub-spaces within the larger expanses. While flexible in terms of function, each space is distinguished by unique, carefully designed features. A shaded courtyard of ‘Korean Sun’ pears is defined by the tree canopy above. An allée of fruitless mulberries recessed two steps below the building is accessed by a sculptural COR-TEN steel ramp that defines a main axis running from the interior. The area beneath these trees is designed to hold a long table for alfresco dining at arts-related events. 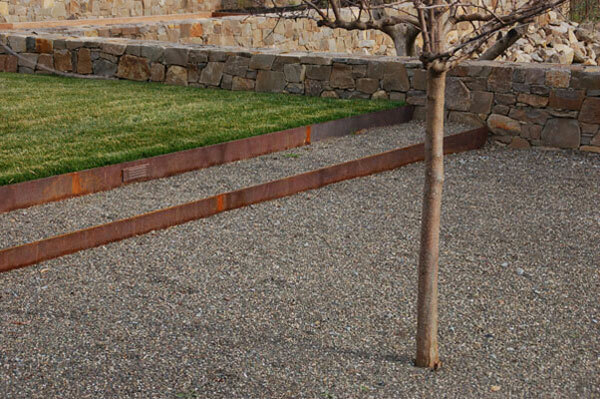 A recessed bocce court is also set into one of the piers, its elevation defining that space. Other areas are shaped by a linear lawn area and a panel of native grasses. The landscape is designed to accommodate both night and daytime use. The subtle lighting respects the agricultural setting and helps to reduce light pollution in the rural skies. 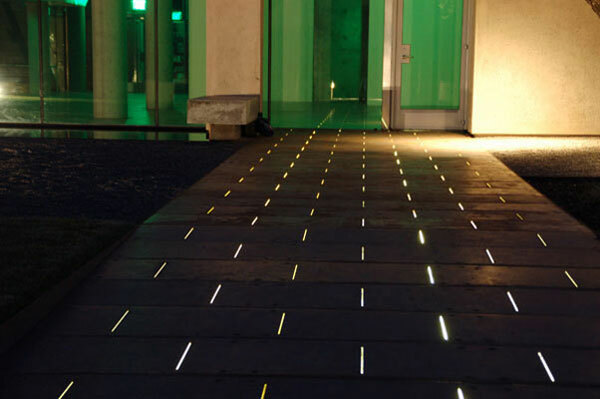 Lights are used sparingly to define spaces and provide safe passage around the site. The COR-TEN ramp is lit from below by narrow slits with hidden LED lights. The bocce ball court is also lit by bands of LEDs tucked under the cedar edging. 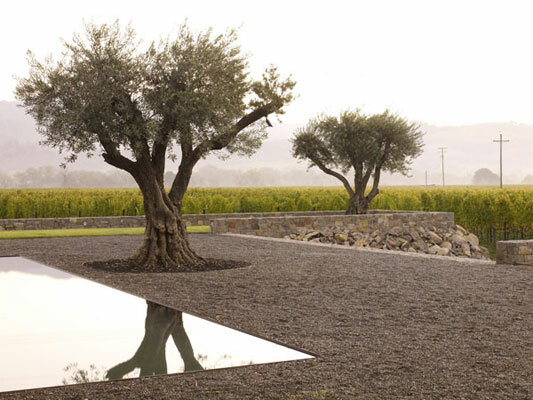 Low voltage lights are hidden in four 100-year-old olives that subtly guide the visitor. 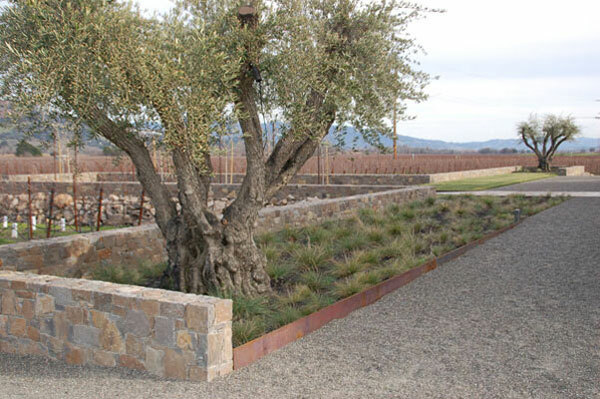 The planar landscape is articulated by the placement of the specimen olive trees, which act as points of punctuation, providing focal elements in the foreground of the immense landscape. Shaping large spaces from these few materials has resulted in a landscape that is both harmonious and celebratory of its surroundings.